MOSCOW, September 1. /TASS/. The death toll from Monday’s riots outside Ukraine’s parliament in Kiev rose to three when another serviceman died from injuries suffered in a grenade blast, the National Guard said on Tuesday. "A soldier sustained serious fragmentation wounds during the explosion. For almost 24 hours, the young man was in a coma in a very difficult condition. However, the serious wounds were incompatible with life," the press service said. Earlier reports said two National Guard members died on Monday and on Tuesday. On Monday, protesters clashed with police and National Guard troops near the Verkhovna Rada building as MPs initially backed constitutional amendments supposed to give greater powers to Donbas. Someone from the crowd hurled a grenade at the police cordons surrounding the parliament building. A total of 141 people have been injured, and most of them - 131-are police officers and National Guard soldiers, including 10 in serious condition. The country’s interior minister has accused Ukraine’s nationalist Svoboda (Freedom) party and its leader Oleg Tyagnibok of this fresh outbreak of violence. 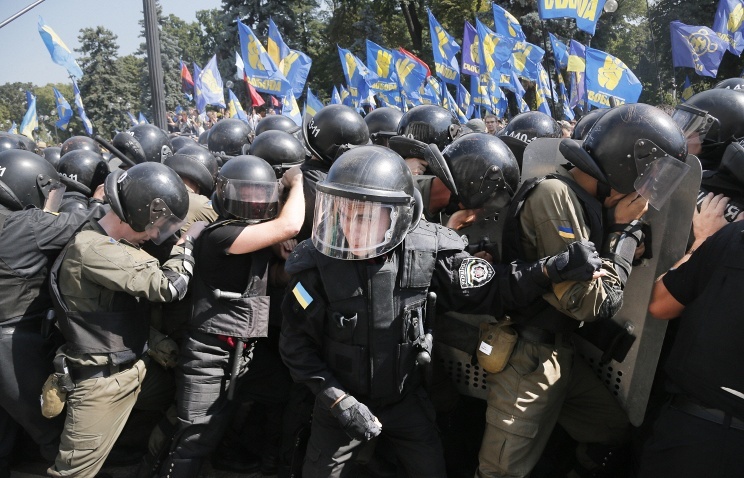 The Svoboda party said the grenade incident was a "provocation" aimed against Ukraine’s patriots. A criminal case into terrorism has been launched. The Interior Ministry has detained 18 people, and five of them remain in a custody cell. DPR parliament adopted a law "On the Interior Troops"